The Bhartiya Janta Yuva Morcha (BJYM) took a aggressive stance against the ruling party with protesting workers charging towards Rail Minister Pawan Kumar Bansal’s Delhi residence demanding his resignation over the railways bribe scam, where his nephew was caught accepting a bribe by a railway employee in exchange for a lucrative promotion. 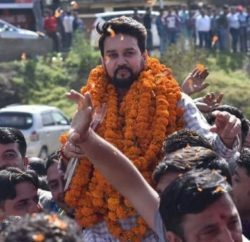 About 150 protesters along with BJP Hamirpur, HP, Member of Parliament and Yuva Morcha president Anurag Thakur, broke two levels of police barricades, trying to reach Bansal’s house. The Delhi police had to resort to the use of water canons to stop them. Anurag Thakur blamed Congress for promoting corruption and demanded resignation of the Railway Minister, Law Minister and Prime Minister Manmohan Singh. Thakur also said that the corrupt UPA government is harming the country and it is high time that they step down. Huge crowds of protesters waving BJP flags were seen climbing over barricades, shouting slogans. The Delhi police said that they will take the protesters into custody for disturbing the law and order situation. 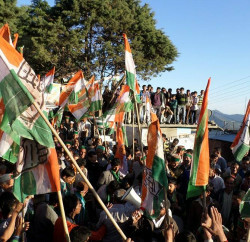 Police said that the protesters were given permission to protest 100 metres away from Bansals house, which they flouted. 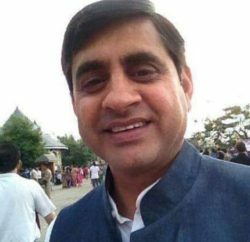 Bansal’s nephew Vijay Singla was arrested last week by the Central Bureau of Investigation (CBI) for allegedly accepting a bribe of Rs.90 lakh. The bribe was paid to him by two people for getting a senior railway officer, Mahesh Kumar, appointed as a member of the powerful Railway Board. However, Railway Minister had refuted all allegations and even Congress party has also refused to take action against him.